President of Dangote Industries Limited, Alhaji Aliko Dangote, on Saturday in Abuja signed a seven-year $650m loan facility with the African Export-Import Bank (Afreximbank) for his oil refinery project in Nigeria. The loan which attracts a moratorium of five years, according to facility terms read out during the signing, as witnessed by Reuters, was signed just as a $750m facility with Nigeria’s Bank of Industry (BoI). Dangote Group Executive Director Devakumar Edwin had told Reuters last week that the oil refinery would cost around $10bn and should be completed by December 2019. To finance the project, he said the company would borrow $3.3bn, arranged by Standard Chartered Bank, while the remainder will be in the form of equity and export agencies. The refinery and petrochemical complex is located on 25,000 hectares of swampy land with a jetty to ferry products by sea within Nigeria and abroad including an undersea pipeline to transport gas. It would account for half of Dangote’s sprawling assets when it is finished next year. Dangote had on June 30, last year during Afrexim’s 24th annual general meeting in Kigali, Rwanda, signed an agreement to provide financing of up to $1bn to the African conglomerate. 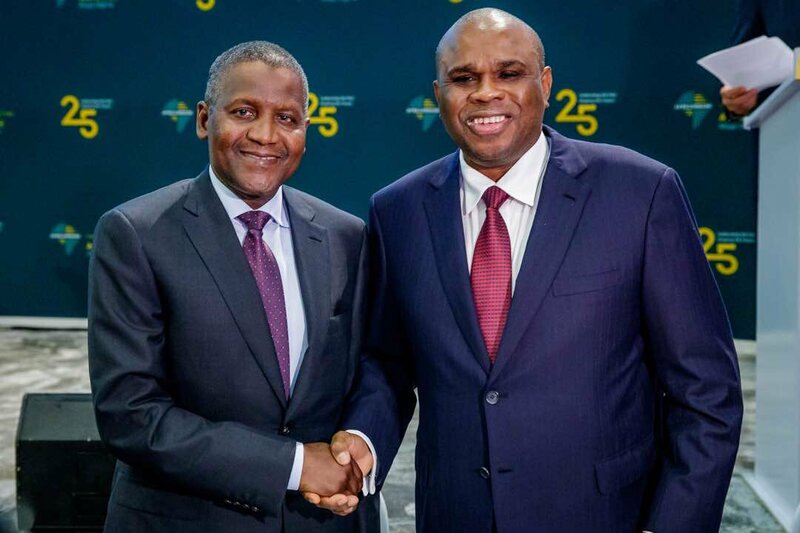 The MOU provides for collaboration between Afreximbank and Dangote Industries Limited in respect of proposed funding of transactions, which could involve the provision of short and long-term liabilities for trade-related projects in Africa. A brief on the MOU said utilization of the facility would boost intra-African trade volumes, enhance continental value chains and increase production and export of goods and services across Africa. Photo Caption: Oramah (left) exchanges documents with, Dangote, during the signing of the 2017 MOU in Kigali.